When you want to offer a touching tribute to a deceased loved one, a funeral flower arrangement is the ideal way to show that you care. It is a way to lift someone’s spirits and to express your sympathy at this time. Floral basket arrangements are ideal choice for funeral flower arrangement ideas. They are also best if you want to send something to the funeral, which can be taken home by the family members after the ceremony. Whether you desire a basket of sympathy flowers to offer condolences, a stunning display of funeral flowers in the form of a graceful wreath or standing spray, or you’d simply like to order funeral flowers online – First Impression can meet your every need at the most competitive price range. 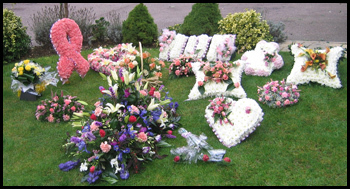 Funeral flower arrangements are available in many designs and must be appropriate for the occasion. Traditional wreaths (circle with cut out centre) bouquets designed in oasis forming either a round domed posy (posy pad) or a tear drop shape (single end spray) a heart or pillow. First Impression ensure that your funeral flower arrangements are in prime condition to be enjoyed on the day.